we got a plan to Cameron Highland, but it was canceled. yeah, i have no faith with Cameron! a lil disappointed, but after a thought, it was fine... work for our future is more important. almost 2 days i have not seen my dear, i miss him so much, but it was not too hard for me, because we both got the same feeling... love! i am very happy, he got me a suprise.. he made me to kitchen, when i walked out, i saw a rapped gift on dinning table... i was wondering if i saw this before or not... i walked to him, and asked if he saw that before he came... he laughed at me and said - darling, that's for you! i quickly jumped over a grab it, and quickly jumped over him and opened the gift. 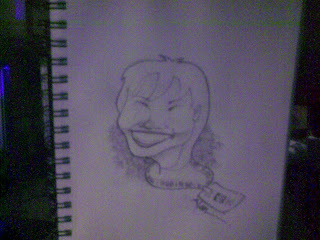 very nice, classic wrapping paper; dear always get good taste... i slowly opened it... it's a sketch book... not a normal sketch book though, my face was in it - a cartoon me! 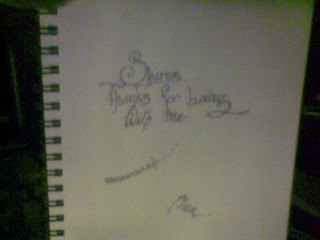 and a message: "Sharon, Thanks for being with me muuuuuaaah.... Alan" - am touched and happy! thanks honey!! we went out bought McD for our dinner, also with 4 cans of our favor beer - Carlsberg Gold. we had dinner while watching Discovery channel - Man vs. Wild. very nice show but a bit disguishting... it was ok! today was our first weekend we spent time at home... it was nice, and comfortable.. we started our small lil talk as usual... dear suggested to get a single bangalow house.. and he told me that our toilet must at least 6 times biggercthan the one in my room... wow... i definately agreed as i want a tub, and a jacuzzi for sure. I wonder, how our dream house could come to picture... i cant wait for him to draw me a sketch of it. I love you darling, and thanks for everything you have done for me... your heart which melt in my way... i long you like the river valley... it will never stop - hahaha - that's your words to me!